This book has hardback covers. Ex-library, In fair condition, suitable as a study copy. Very Good. B-format paperback. 304 p. The latest New York Times bestseller from one of today's most inspiring writers. But then Al decides instead to take a walk-no ordinary walk, but one that would take him to the farthest point on his map: Key West, Florida. The people he encounters along the way and the lessons they share with him, will save his life-and inspire yours. Good. B-format paperback. 304 p. The latest New York Times bestseller from one of today's most inspiring writers. But then Al decides instead to take a walk-no ordinary walk, but one that would take him to the farthest point on his map: Key West, Florida. The people he encounters along the way and the lessons they share with him, will save his life-and inspire yours. Mr. Evans has a way of telling a story that you only wish more authors had. I have now read all his books & am in the process of purchasing them for my personal library. I felt as though I was right there - embedded into the story - with all my senses in full alert! I was absolutely sure that these stories were true & that no one could write a journal or describe events with such veracity solely using the imagination. 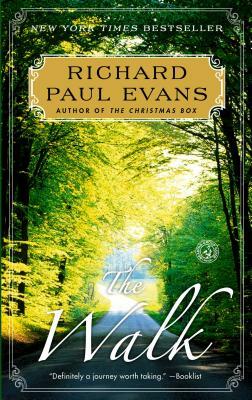 5 stars for R.P.Evans' The Walk & all the books in the "Walk" series. After realizing this was a trilogy, read 6 more of Richard Paul Evans books. Unexpected study of people across the country and interesting info about the states he crossed.